The Apple iPad may be great for web-browsing. It may be the best slate on which to list half of the 10 Commandments since solid rock. But, for gamers, well, thou shalt have some legitimate doubts about this thing. Why might the iPad not become the next great player in games? Uh, It's A Giant iPod Touch: If our man in San Francisco is sitting at Apple's press conference, waiting for Apple to announce a revolutionary way to play games via the iPad, well, I hope he lifts his feet when the janitors come by to sweep the floors. The wait could be long. As best we could discern from today's announcement, the button-less, tilt-sensitive, touch-screen iPad offers no game-controlling interface improvements over the button-less, tilt-sensitive, touch-screen iPod Touch. In fact, the iPad doesn't appear to even have a camera, which has been supported by some iPhone games. The iPad just shows games bigger. It shows them Beautifully, of course, but Nintendo convinced the world a few years ago that graphical improvements are not the key to modern game machine success. The Third Pillar Might Not Stand: Back in 2004, Nintendo was preparing to release a new gaming device, the DS. The two-screened system is a hit now, but back then it seemed about as unnecessary as a third shoe. Nintendo claimed that the portable DS would become a "third pillar," as crucial a strut to Nintendo's fortunes as the home console and the portable Game Boy. But that didn't make much sense, because the DS, which could play Game Boy Advance games seemed like it would need to supplant the Game Boy line to be successful. Why, really, would someone need two portable Nintendo machines? And so the question can now be asked of Apple: If your consumers still need a computer and a phone, needs which you already can fill, what room in their wallet, their bag and their life is there for a semi-portable, semi-desk-ready tablet computer? For gaming or otherwise? App Apprehensions: It's wonderful to hear that the iPad will run iPhone and iPod Touch games, but those games were made to run on a screen the size of an iPod Touch, not a screen a little bigger than a Superman comic book. Do you want to run iPad games in a window while you multi-task on the iPad? That would be the closest you'd get to having App Store gaming available on a computer you can sit down with. Well, no can do. You can't multitask on an iPad. Plus, we're talking about games that either won't fill the iPad screen or will have to be blown up by users to play at bigger than their native resolution. We're told that the iPad supports "pixel-doubling" which will compensate for that, but it's hard to get that excited about the concept of playing iPhone games, but larger. The best hope here is that the early announcements of iPad-enhanced games such as Nova and Need for Speed Shift will swiftly give way to announcements of iPad-original games. The Cost: You could buy an iPhone 3Gs for $299, a Nintendo DS for $129, a PSP for $169, a Wii for $199, an Xbox 360 starting at $199 or a PlayStation 3 starting at $299. Or you could buy an iPad starting at $499, gamers. Tough sell? Versus PC Gaming: You can look at the iPad as a super-sized iPhone. You could look at it as chunky big brother to the DS and PSP. Or you could look at it as the most gaming-ready computer Apple has every released. In that last respect, the iPad is a nice advance for the prospects of being able to put an Apple product on your desk and play games on it. But in that last context, the iPad must be compared to, well, Windows-based computers. The barrier to entry for developers is low for either: Make an App for the iPad. Make your own game for the PC. Grassroots developers could flourish on either platform. But we're likely to be seeing sized-up portable games on Apple's iPad for a while. They will be compared to fully-realized PC games that can be run with controllers, keyboards and mice. Advantage, Windows gaming... for now and for a while, it seems. Room For the Little Guys? One of the best stories about gaming on the iPod Touch and iPad has been how the App Store allowed the smallest developers to vie in the marketplace against the biggest game publishers. The result of that competition has been wonderful games from the littlest crews to the biggest, everything from Tiger Style's Spider to some of EA's best. The bigger screen size of the iPad, however, may raise expectations for the quality of graphics on iPad games — and smaller studios may find it more challenging than the EAs of the world to create games that are as visually pleasing as they were on the iPod Touch and iPhone. Inherited iPhone Issues Some models of the iPad will run over Wi-Fi. Others can run on the 3G network, which raises questions about whether they will run into the same networking issues that plague games played over networks on the iPhone. Another possible problem involves Apple's control of software for its devices. Gaming on the iPhone/iPod has been hampered by Apple's sometimes-unpredictable moves to remove some games from the store due to rights complaints. It's Apple's right to do so, but those who disagree with Apple's decisions could come to look at an iPad as another gaming device that is firmly controlled by its platform holder, just like an Xbox 360 or Sony or Nintendo machine. We're not talking about a market as free as Windows gaming or even Facebook gaming, for better or worse. Hard To Handle? : Do gamers want to grab the short ends of a magazine and then pretend they are gaming? The original Xbox controller wasn't even that broad and it was a bust. Or would you rather trace your finger on a placemat? Those seem to be the two most likely postures for iPad gaming, an experience devoid of buttons and control sticks. iPhone game developers are still figuring out how to make games fun with some of the same feature restrictions. The iPad's added size looks to make such problems with iPhone gaming controls and comfort even more pronounced. 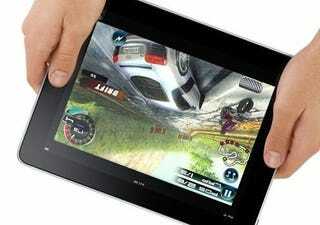 There are some reason to be excited regarding the experience of playing games on the iPad. Modern Apple products generate an enthusiasm that few other devices do. But Apple still has a long way to go before it can boast that the iPad as an option of first or even second resort for those who want to play video games. When it was just a theoretical device, the iPad had the potential to be a must-have for gamers. Right now, it appears to be more of a "maybe," one that, from the get-go, instills as much doubt as it does enthusiasm about the newest way to play video games in the 21st century.